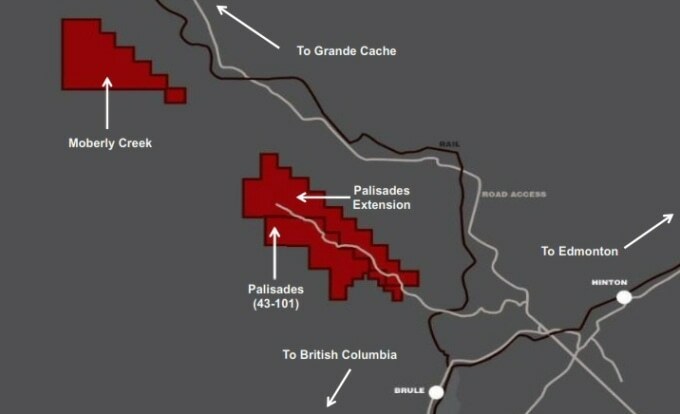 Altitude Resources Inc. is pleased to provide an update on the 2016 exploration program at the Palisades Project in west central Alberta, conducted with its joint venture partner, JOGMEC. On June 9, 2016 Altitude announced that it was proceeding with a two-phase exploration program on the Palisades and Palisades Extension coal properties as part of the Altitude-JOGMEC Joint Venture. In mid-June, Altitude mobilized the project and initiated road building to its intended drill sites. Drilling equipment was mobilized to the site and drilling commenced on July 21. Depending on weather, drilling is expected to be completed by mid-August 2016. The budgeted 2016 program is CDN$1.55 million. Dahrouge Geological Consulting (Dahrouge) of Edmonton, Alberta has been contracted to carry out the 2016 program. Meanwhile, seaborne traded coking coal pricing has increased by almost 20% for the last three quarters of 2016. Spot prices have seen spikes to in excess of USD $100 due to increased activity in Asian steel markets. Prices are expected to continue to be robust in the mid-term especially for high fluidity coking coals. Commenting on the activities, President and CEO, Gene Wusaty said, "We are very pleased with our ongoing exploration activities at our Palisades Project in collaboration with JOGMEC in light of the fact that coking coal prices continue increase."